THINKING OF SELLING OR RENTING? Due to recent increased demand we are desperately short of both sales and rental properties. Special offers available this month, enquire at the office. 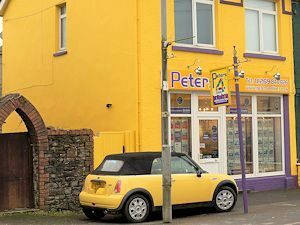 The main office of Peters & Co is at Cross Hands which has a Llanelli postal address. Our Firm is listed as Estate Agents in Llanelli as the majority of properties we are selling and renting have Llanelli postal addresses and we also have properties for sale within Llanelli town centre itself. The Firm was established over 40 years ago and were the first estate agents to have ground floor showroom offices in Carmarthen town. We are highly respected and established Estate Agents in Carmarthen and have a prominently located prime town centre display unit within Carmarthen Market where all our properties for sale and to let are displayed. Peters and Co is one of the top performing Estate Agents in Carmarthenshire and our properties for sale and to let are featured on several dedicated property web sites – we maximize the opportunity of advertising properties for sale on numerous web sites to gain as much property advertising coverage as possible. With over 40 years experience, a thriving office at Cross Hands and a Property Display Unit at Carmarthen Market we are able to offer a friendly professional service at very competitive fees. CALL US BY TELEPHONE OR CONTACT US BY E MAIL TO ARRANGE A VALUATION. We sell properties along the M4 corridor between Carmarthen and Cross Hands in Carmarthenshire and also along the A484 from Cross Hands to Llanelli in Carmarthenshire. Our Main Office in Carmarthenshire is at Cross Hands (Tel: 01269 844826) but we have a distribution and display centre within the Carmarthen Indoor Market (Unit 5), being a prime location within the St Catherine’s Walk Shopping Centre in close proximity to Debenhams, Top Shop, Next, River Island, New Look and other major national retail shops within Carmarthen Town. Sales particulars of properties for sale in Carmarthenshire can be collected from our unit in Carmarthen Market.